YouView trials Amazon Alexa for voice-activated TV control | What Hi-Fi? You could soon be speaking to control your YouView set-top box, thanks to Amazon opening up the software to developers. YouView may soon get Amazon Alexa support, meaning you would just have to speak to control your set-top box. Amazon recently opened up the Video Skill API (application programming interface) to developers of all TV apps. YouView is one of the companies that has announced it will trial the technology - more should jump on board soon. If it does roll out Alexa, anyone with a YouView box and an Amazon Echo speaker will be able to control their set-top box with voice commands. For example, say "Alexa, change the channel to BT Sport 1" and Amazon's helper will do your bidding. Just saying "Alexa, play EastEnders" should do the trick, too. At the moment, devices containing Alexa are Echo, Echo Dot and Echo Look speakers. 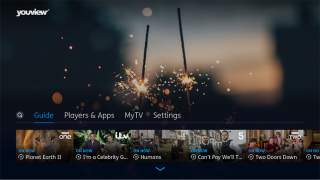 "We constantly challenge ourselves to identify key technology that will improve our TV service, and allow our customers to easily access the full range of content available on the platform," said Aleks Habdank, managing director of TV at TalkTalk, a partner of YouView. "Amazon Alexa is a prime example of the kind of innovation that we look to invest in, and [we] are incredibly excited to see the results of this partnership." Amazon announced the Video Skill API - which lets developers add Alexa functionality to their apps - in a blog post. "Companies can now teach Alexa how to interface with their video content and services," it wrote. "This means you can build experiences that allow your customers to easily find and consume video content without invoking a specific skill. For example, a customer could say 'Alexa, play Manchester by the Sea' without specifying a provider or device." There's no word on when Alexa will come to YouView, or other TV services.